Drifter's is a tapas-styled restaurant in the Old North End of Burlington. The inspiration for Drifter's came from an aspiration to create a laid-back atmosphere for anyone to come and enjoy fresh food, local drinks, and hang out with those around them. Everything at Drifter's - our open kitchen, affordable meals, and even the name itself - is designed to generate an inviting and relaxed environment. Other beers, mead, wines, & ciders vary in price but most are local! DUE TO OUR SMALL ESTABLISHMENT WE DO NOT TAKE RESERVATIONS. Our customers love our laid-back environment, perfect for one wanting to drift in and out, or even stick around a while. To stay true to our style we invite our guests to settle in and then head to our counter to order a bite and grab a drink. But don't worry, we love interacting with our customers and will bring delicious food right to your table. We offer both indoor and outdoor seating with a private outdoor patio, perfect for enjoying beautiful Vermont weather. Dogs are also welcome. Want to enjoy our food at home? Call us during business hours to order take-out! Rent our intimate space, let us cater your party - or both! Email us for pricing on space rental! Curious of what we could offer? Check it out! We can customize, individualize, vegan-ize…. you get the picture. House salad $5 per person: Carrot Kimchi, toasted pistachios and our carrot ginger vinaigrette. VT Artisinal Cheese Board $10 per person: House made crackers and bread, house made pickles. Baked Brie $40: Wrapped in puff pastry, seasonal fruit chutney, sliced baguette. Shrimp cocktail $25 doz. : Poached jumbo shrimp, cocktail sauce, lemon and arugula pesto. Chips and dip $4 per person: House made naan chips, choice of arugula and artichoke dip or hummus and pickled vegetables. BLT Crustini $2 each: Candied pork belly or candied seitan, tomato jam, baby arugula on grilled baguette. House made meatballs $2 each: Local beef or house made vegan. Served with smoked tomato sauce or lemon curry aioli. Slider bar $5 each: Choice of BBQ pulled pork, BBQ "pulled" jackfruit, mushroom barley burger or local beef. Served with homemade buns, pickles, fried onions, condiments. Taco bar $5 each: Choice of spiced seitan, BBQ pork, pork belly, confit duck. Served with a stack of toasted corn tortillas, hot sauce, habanero aioli, scallions, cilantro, kimchi or pickled cabbage. 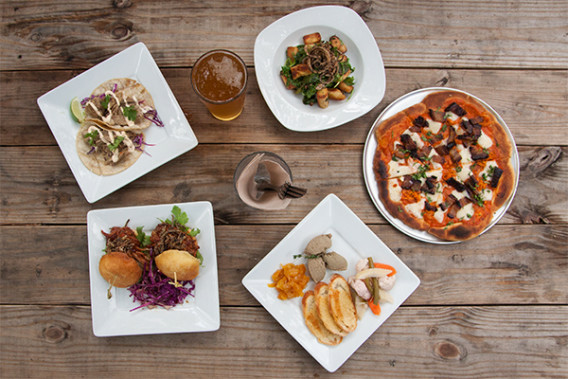 Flatbread platter $7 per person: Choice of four cheese, seasonal vegetable, Korean pork belly.